Kleefeld on Comics: On Business: Will This Work? 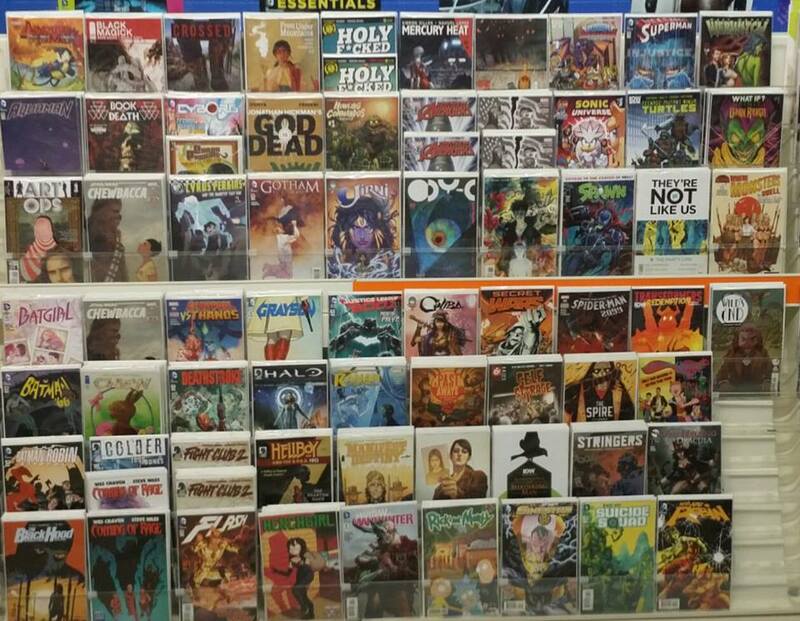 Last week, as Halloween was approaching, I looked around a bit for what local comic shops were participating in Halloween ComicFest and to what degree. One of the perks of living in the Chicago area is that there are loads of comic shops relatively nearby, which gives you as the reader/consumer a good amount of choice in selecting the specific type of comic shop you want to frequent. I've been to many of the closer ones on previous Free Comic Book Days and ComicFests, so I wanted to check out the one who seemed to be putting the most effort into the event this year. What I was surprised to discover is that earlier this year, another shop opened a little over a half hour away. They looked like they were planning on a fair amount of celebrating for Halloween, so I thought it'd be a good shop to check out. Ultimately, my schedule didn't permit me to visit on Halloween itself, I managed to swing by on Sunday. I knew from their website that they'd done a fair amount of remodelling work, and it showed. The place was well-lit, clean, and organized. Not cramped at all. In fact, they looked like they had more space than they knew what to do with. The manager greeted me as I walked in and pointed out some of the leftover free comics as well as the back issue and TPB sale they had going on. As I looked around, I noticed a couple things. First, they had a large back issue selection. Nothing super old and valuable, but I think there were maybe about 40-50 long boxes of back issues, another 25-30 of back issue sets they'd bundled together, and another 20-ish that were designated as dollar bins. They had the space for them all, as I said, but what was curious (to me) was that their trade paperback and hardcover selections were limited to maybe five or six half-empty shelves in the back. There's nothing wrong with that, but it was striking to me as being the largest back issue stock I've seen in a comic shop in six or eight years. And more striking was that was the fewest number of trade paperbacks and hardcovers I've seen in probably 15-20 years. The shop clearly catered more towards the superhero side of comics. They didn't exclude other genres -- I saw a reference to a semi-local creator signing from a couple months ago who has a series out that's kind of in the same vein as Mouse Guard -- but they didn't seem to normally stock much that wasn't from Marvel, DC, or Image. But interestingly, it was mostly superhero comics with a surprisingly limited selection of action figures, statues, and other peripherally related material. I think I saw maybe five action figures in total. Now, given that the store is less than a year old, it's possible that's part of their business plan. Maybe they're planning to use their existing collection of back issues as stock as they slowly build up a library of graphic novels, ordering a handful every week or month. Or maybe they've done a survey of area collectors, and they're deliberately targeting people on the hunt for back issues with little expressed interest in collected editions. But, and this is just a hunch, I get the impression that they simply built a comic store because they have a lot of comics. I'm not saying this to badmouth them. I dropped $30 on back issues while I was there. I want everyone who works in comics in any capacity to succeed. But it's curious to note when a new shop seems to operate on a model that is very much not what most shops are operating under any more. I can't help but wonder what their thinking is. I mean, I know that shops with this type of business model still exist, but they still exist -- that is, they've been operating this way for years, and just haven't changed. Stepping into the business new like this seems... more challenging than it needs to be. The shop is far enough out of the way that I won't be able to swing by often, but it'll be interesting to see what changes, if any, they make in the coming year.